It’s time for a little design talk. Today’s topic: Vintage Signs. 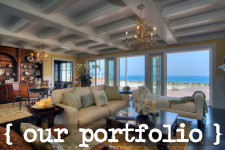 We want to show you design ideas that we love and don’t love as much. 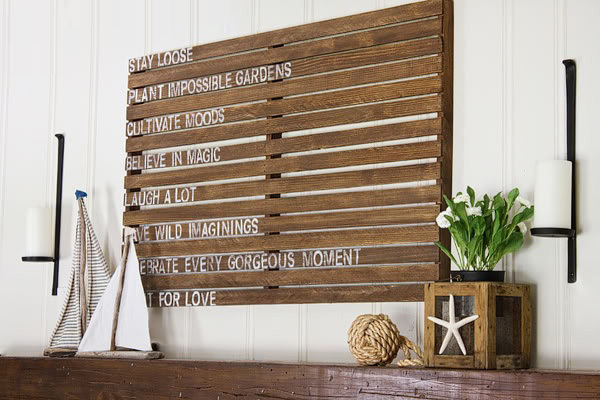 Vintage signs are a great way to give that blank canvas called a wall life. 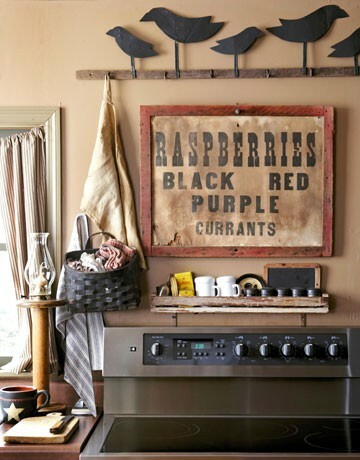 A vintage sign can help your walls speak, literally. 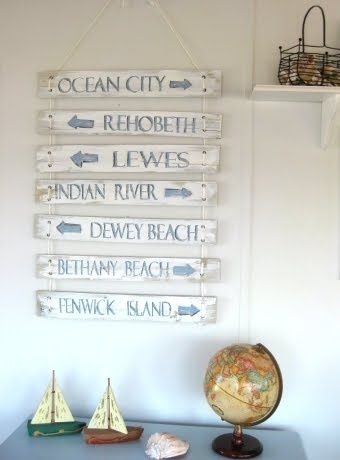 You can grab old vintage beach signs, put up vintage market style signs, or even make your own that can say whatever you’d like. It’s all up to you! 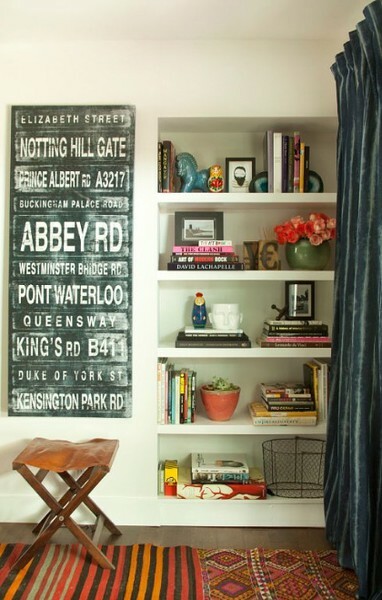 We’re just going to give you a little guide to signs and how to maximize their use in your space. We aren’t going to get technical and tell you that the sign or artwork should hang no more than 7 – 10 inches above a side table , even though that’s right, but more so show you what looks good and sadly, what doesn’t. This is a very simple and cute use of a vintage style sign. Could there be more done with the space? Of course, but we like the sign and the use of the sign. The spaces shows you what’s out there and a basic way of getting started. This sign makes great use of the wall. With the built in storage in the corner of the room it doesn’t leave you with too many options for the wall next to it. The sign, being a great choice, complements the space perfectly! It’s large and draws enough attention, but isn’t annoying or too stand out-ish. If you need to cover some blank wall space and can’t fit a side table, sofa or some other type of furniture there, let a sign own the space. One of our favorite vignettes out there. 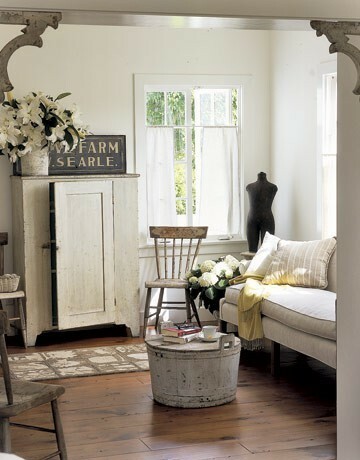 It has a gorgeous, rustic feel that makes you want more. 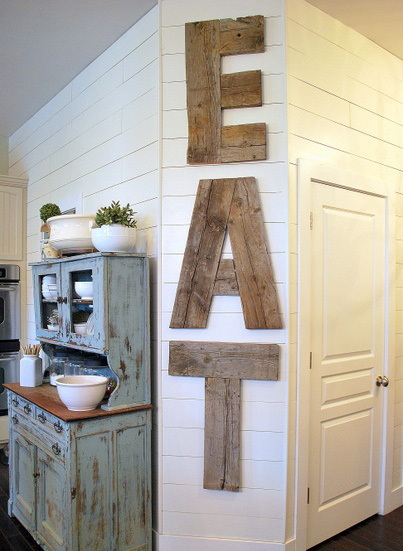 This is a great example of a vintage market sign that fits nicely into the kitchen. The colors and even the surrounding pieces just make this space stunning. Hands down the favorite. This room has some many great pieces and just makes you feel right at home. We love this space because the room feels 100% natural. Nothing feels or looks forced. The sign thrown in there just adds character and compliments the room flawlessly. The whole sign isn’t even visible, but some how it works out even better that way. This is Tuvalu love. This is vintage signing gone wrong. It’s overkill and kind of scary to be honest. Even though there’s only a few pieces in this space, the overdone sign make it’s feel cluttered, messy and dirty. Be careful when trying to find a sign that covers your wall. Make sure it doesn’t look anything like the picture above. Also make sure that it relates to it’s surroundings. Side note: is that chainmail hanging from the wall? What is that? Want to grab your guests attention? Well this is one way to do it! We like the idea of trying to use that semi-awkward space, but this is a little much. We think if they went smaller and maybe even went with multiple pieces this space could have turned out great. Instead they went large and in your face. Time to EAT! Lastly, there is just too much going on. It feels like they tried to squeeze as much in as they could. We like red, white and blue, but when it’s done right. 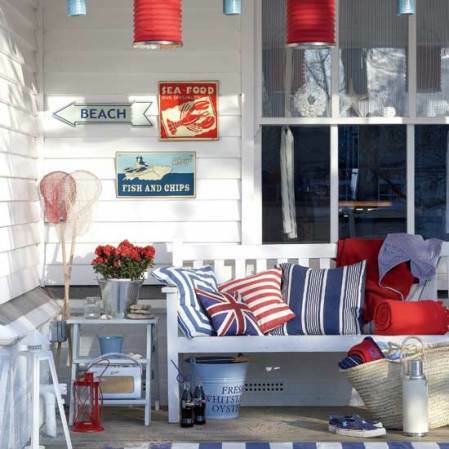 The signs almost look like they were an after thought and thrown in because they were ‘needed’ to complete the coastal, beach house look. Let’s avoid this all together. I have two vintage signs at my downstairs door one says Laguna Canyon and one says Pageant of the Masters they are made out of tin and old wood… LOVE THEM!!!!! Good choices! I bet they look beautiful!